When Simone Biles watched video of her performance at last month’s U.S. Classic, there was really only one routine she wanted to see. The reigning Olympic champion fell off uneven bars that night, bruising her heel in the process. While that might seem like an odd thing for Biles to focus on from her first competition in almost two years – a competition she won easily, no less — it also gives a glimpse of what will make the woman who was unbeatable during the last quadrennium even more formidable this time around. Oh, Biles still has jaw-dropping skills. At that meet last month, she posted the highest scores in the world this year on vault, floor exercise and balance beam. This despite a less-than-clean landing on vault and a step out of bounds on floor. But at 21, with one Olympics behind her, Biles is both more experienced and more mature. She knows how to pace herself for the buildup to Tokyo, and she knows one meet in the summer of 2018 isn’t going to dictate what she’ll do in the summer of 2020. While other Olympians who have taken a year or two off have needed time to regain their old form, Biles is not only already there but also better. In the gym only since November, she’s upgraded her floor exercise, vault and uneven bars. The one area that’s lacking is competition fitness. This weekend’s U.S. 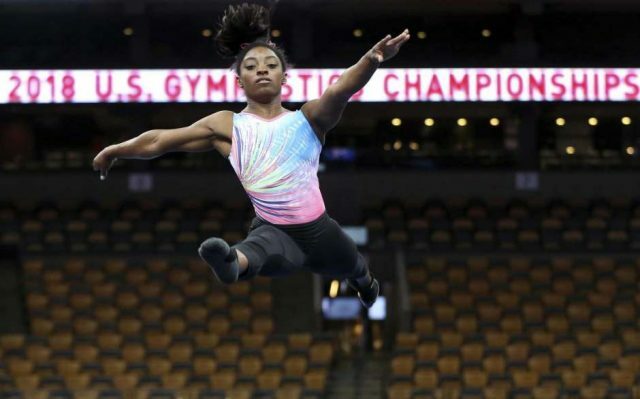 Gymnastics Championships is Biles’ first two-day meet since Rio and, after how wiped out she found herself after the one-day Classic, her biggest concern is remembering how to pace herself. That doesn’t mean there will be an opening for anyone else, however. In the lead up to Rio, her fellow Americans joked about creating a “non-Simone division.” Little has changed. New national team coordinator Tom Forster said he doesn’t think there’s anyone in the world who can beat Biles right now. His answer to the next question, if anyone is even close, was even more telling. Biles is well aware of the lofty expectations on her. Beginning with the 2013 national championships, she won every meet she entered for the next three years – often by healthy margins. She was the first woman to win three consecutive world all-around titles, and she left the Rio Olympics with five medals, four of them gold. Her return has been one of the few bright spots in the last two years for USA Gymnastics, which has been widely criticized both for fostering the culture that allowed Larry Nassar to prey on young gymnasts and not moving quickly enough to change it. Biles and Final Five teammates Aly Raisman, Gabby Douglas and Madison Kocian have said they are among the hundreds of women who were sexually abused by the longtime physician for USA Gymnastics and Michigan State. While it is not Biles’ responsibility to fix the federation’s considerable issues, she also knows she is the one person who can turn the public’s attention from the scandal to what the current athletes are doing. Being in this position might have been daunting when Biles was younger. But her success in Rio forced her to think long and hard about coming back, and she’s very clear on her reasons for doing it. It’s a healthy, mature attitude to have. That said, only a fool would bet against Biles in Tokyo. Or anywhere else, for that matter.